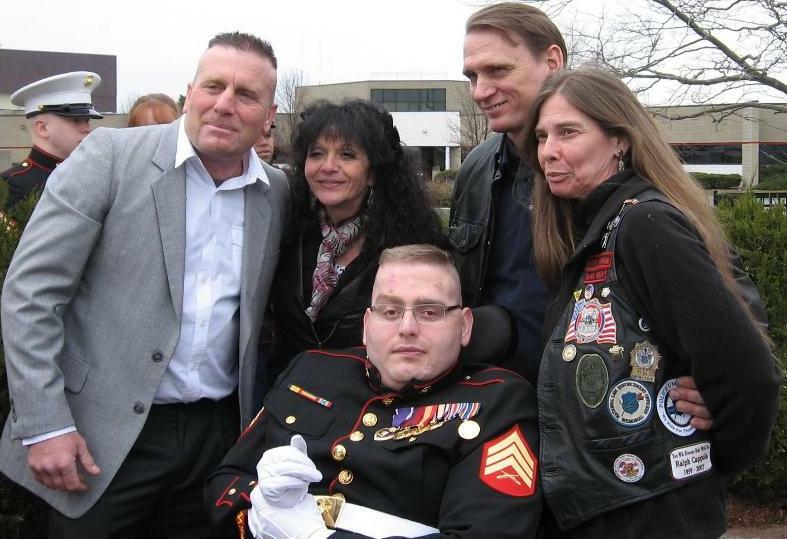 Sgt Eddie Ryan, the Marine Corps sniper who was mortally wounded by friendly fire in Iraq in 2005, but recovered by the grace of God and the inner strength of his family and himself, retired from active duty in the United States Marine Corps yesterday. It was a gray day with a piercing chill at Stewart Airport but the cause of the event brought an inner warmth to all present (about a hundred guests). 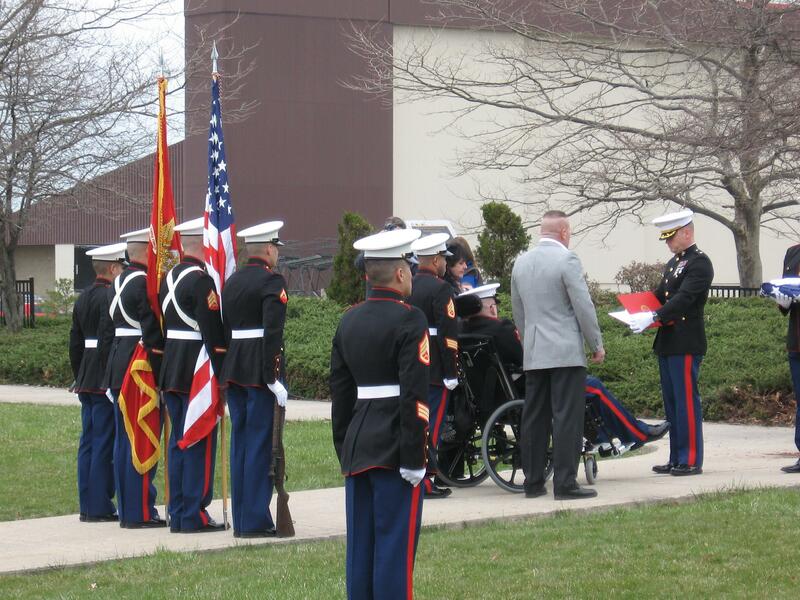 Two platoons of dress blue clad US Marines stood at attention and then at ease as Sgt Eddie Ryan, USMC, in his dress blue uniform sitting in his wheelchair was retired from active service after 8 years of duty. The several speakers described how Eddie always wanted to follow in his father’s footsteps and be a Marine. They related the several actions in which Eddie participated. It was told how Eddie wanted to be and then became a Marine sniper before his 2nd deployment and how on that fateful day, he received 2 bullet wounds to his head and how 2 of his brother Marines extracted him under fire to safety. Colonel Hussey (Army), who began his military career with 3 years in the Marine Corps, described how Eddie’s mom and dad flew to Germany to say goodbye to their dying son. Eddie, however refused to oblige and has brought himself back. The Colonel went on to tell Eddie that this wasn’t really a retirement but rather, a new assignment, after all, once a Marine–always a Marine. Eddie’s new assignment is to educate our youth and citizenry about the love and sacrifice of today’s military in procuring for them the peace and prosperity they enjoy. Semper Fi! A reception was held later at the Fallkirk Country Club outside Highland Mills. 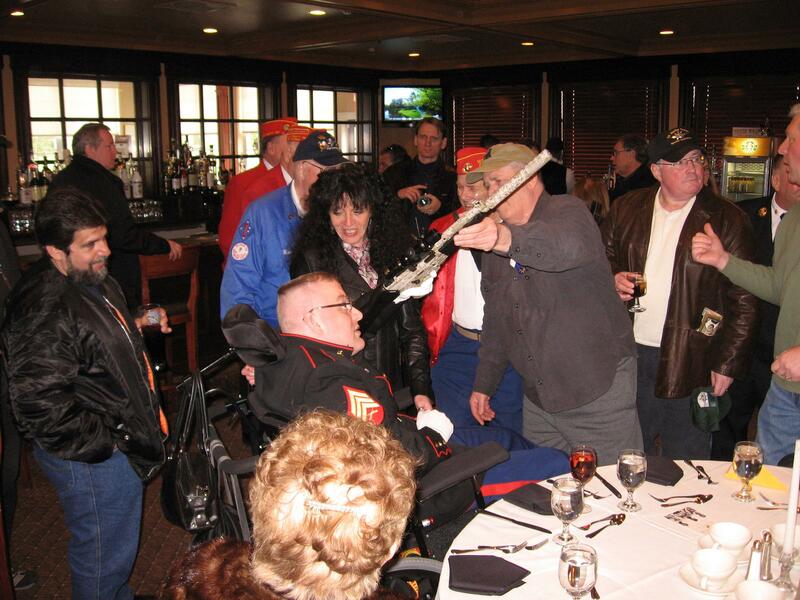 Attendees (100+) were treated to a sumptuous buffet lunch provided by Barry Fixler from the proceeds of his book, “Semper Cool.” The speeches given by the the many attendees emphasized the closeness of that band of brothers known as the USMC. Not enough can be said about the love and dedication of Eddie’s parents, Chris and Angie Ryan, and the brigade of groups and individuals that helped to make his recovery possible. Semper Fi, Marine! Eddie is also mentioned in the first part of this news video.